The $16 Coles Rainbow cake becomes fancy quickly for a kids' birthday. Coles is selling a $16 fancy looking rainbow cake for your kids' next birthday party. Finding the right cake for your child’s birthday party can be stressful. Anybody who has so much as looked at a birthday cake book is reminded that the ‘easy’ princess cake is… not easy and the expectations seem to be sky high. 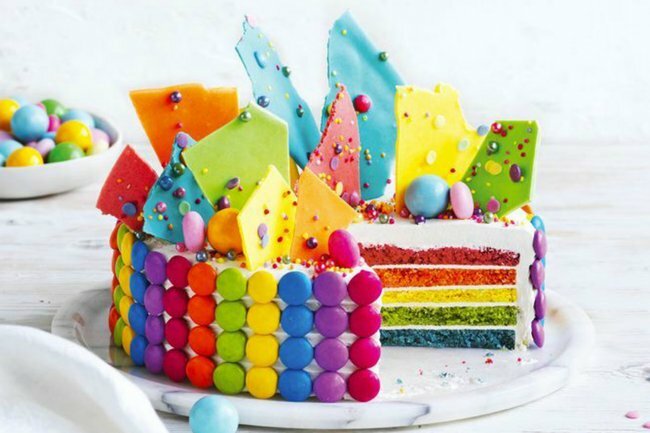 But Coles have just provided a happy alternative: a $16 rainbow cake that looks fancy AF. The masterpiece has five different colours layered inside, and is frosted with thick white icing. With or without decoration, colours get children excited, but it also makes for the perfect base to decorate. 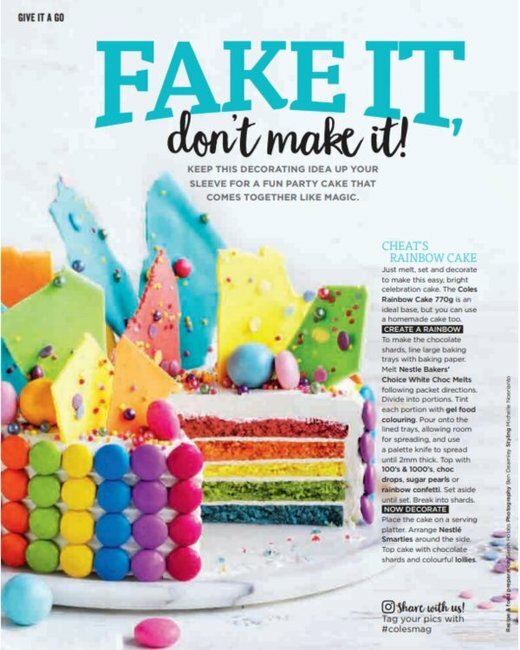 The supermarket chain have also provided an idea for decorating the cake in the Coles Magazine. And it’s a simple way to make a delicious cake look very very fancy. Firstly, you need to make chocolate shards. Begin by melting Nestle Baskers&apos; Choice White Choc Melts, and dividing the gooey mixture into portions. Once the melted chocolate is separated, tint each portion with gel food colouring, and pour onto a baking paper lined oven tray. Make sure you spread it until it&apos;s about 2mm thick, and then get decorating, sprinkling 100&apos;s & 1000&apos;s, choc drops, rainbow confetti and sugar pearls over the melted chocolate, and leave to set at room temperature. When it&apos;s set, smash it into shards, and arrange the shards all over the top of the cake with lollies. If you wish, you can then arrange Nestle Smarties around the edge of the cake. Then wait for your friends to gush. Carrie Bickmore had a go at making the cake, and it looks delicious (and very fancy, too). Evie wanted a cake from the @colessupermarkets magazine for her birthday ???? so Ollie and I gave it our best shot making it. Not a bad recreation ???? Even had rainbow cake in the middle. ???? We are available for hire for any occasion ???? No one has to know you didn&apos;t make the whole thing either. Now that&apos;s what we call a parenting win. Have you tried the Coles rainbow cake? Tell us about it in the comments section below.